Santa arriving last year.Photo by Mitch Ridder. Hospitality Night 2018 will be held on Friday, Dec, 7 from about 5-10 p.m. 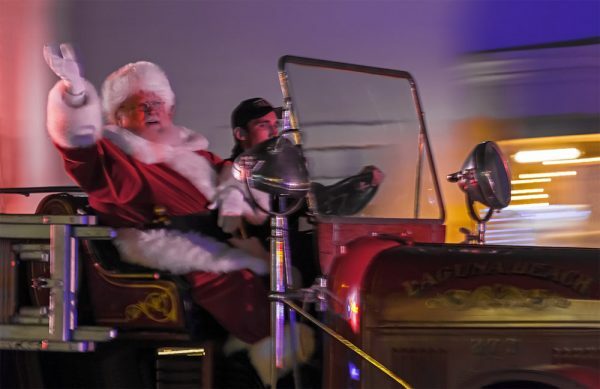 The festivities will take place in the Peppertree Lot (Lot 2 between Ocean and Forest Avenues), where Santa Claus will arrive to greet holiday revelers before the tree lighting at 6:10 p.m. Hospitality Night is co-sponsored by the City of Laguna Beach and the Chamber of Commerce to celebrate the start of the holiday season. After the tree is lit, the city has arranged activities including live music, cookie decorating, arts and crafts, and letter writing to the troops. Santa will be in his hut on lower Forest Avenue to meet families for photos. Downtown merchants, nonprofit organizations and the Chamber of Commerce will also provide open houses and other entertainment. The public should expect heavy traffic on Dec. 7 during the afternoon and evening commute, and motorists are encouraged to take alternate routes or carpool. Street closures in the downtown area will begin at 3:30 p.m. on Friday. Portions of Forest Avenue, Beach Street, and the Pepper Tree Parking Lot will be closed to vehicular traffic prior to and during the event. To sign up for text message traffic alerts, text 92651 to 888-777. The free neighborhood trolleys will run from 4-11 p.m. and free public parking will be available at the city’s Forest/Laguna Canyon (Lot 11), Lumberyard (Lot 12) and Community and Susi Q Center (Lot 13) parking lots. Visit lagunabeachcity.net/cityhall/community/special_events/hospitality_night.htm for a complete detailed schedule of all the Hospitality Night events. For more information, contact Adam Gufarotti, Senior Recreation Supervisor, at 949-497-0304.